In honor of May&apos;s Feast Day of San Pasqual, patron saint of cooks and shepherds, Rocky Durham serves up New Mexico lamb recipes. As a culinary instructor for many years in my hometown of Santa Fe, I have fielded questions from my students regarding the images of San Pasqual stamped in tin, painted on retablos, even embroidered on dishtowels. (Fact: A chef’s kitchen can never contain too many images of San Pasqual.) To answer them, I consulted with a learned colleague and practicing Catholic, who informed me that Paschal Baylon (the saint’s given name) was never canonized by the Roman Catholic Church. Instead, he was canonized by a French Pope in Avignon, France; thereafter he earned the status of a folk saint, rather than the official variety. Never venerated in Europe, San Pasqual was worshiped in small enclaves in the New World—such as New Mexico. But I suspected that San Pasqual was canonized for something greater than simply making heavenly food for his brothers, so I delved into research about the man’s life. Paschal Baylon was born on May 24, 1540, in Torrehermosa, in the province of Zaragosa, Aragón, in what is now Spain. That day coincides with the Feast of the Pentecost (seven weeks after Easter), or, as it is known in Spain, La Pascua del Espíritu Santo (The Pasch of the Holy Ghost)—hence his given name, Paschal. The son of peasants, from the age of seven Paschal worked as a shepherd. Even as a child he showed signs of the profound devotion that would become one of the most prominent features of his character, along with charity, self-sacrifice, and courtesy to others. It is said he even taught his flock of sheep to kneel and pray. When he was 24, Paschal was received as a lay brother among the Franciscan friars of the Alcantarine Reform. In the cloister, his duties were to prepare meals and keep the kitchen clean. He was hesitant to accept such a role; it was hard work, and he feared it would keep him from his prayers. However, Paschal found cooking to be meditative, and discovered that he could be deep in prayer and still prepare food. One legend says that Paschal summoned angels to help him with his chores, so that he could pause to pray. Paschal died in the town of Villa Real on May 17, 1592. His body lay in state, where it proved incorruptible—a sign that he might be a saint. Paschal was beatified in 1618 and canonized in 1690. Pope Leo VIII declared St. Paschal the special heavenly protector of all Eucharistic congresses and associations. Regardless of your faith, the story of Paschal Baylon resounds in all of us who love to cook: It’s the story of a person who found a sense of divine purpose simply by preparing food for others. If you know me, you know I’m a huge fan of celebrations. 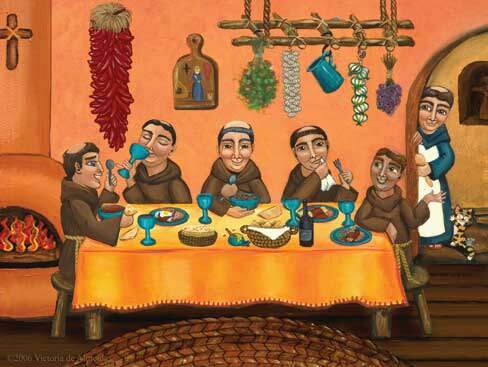 Please join me this May 17 in preparing a feast to honor San Pasqual. Perhaps you’re not a great cook—that’s OK! Let’s take a lesson from the young shepherd and transcend our own kitchen skills. Perhaps you’re not a Catholic? That’s OK, too! No law prevents you from adorning your kitchen with the image of a great 16th-century chef, or from lighting a candle in his memory. Perhaps you’re not a New Mexican? Well, nobody’s perfect! We invite you to come visit us anytime you want! I’ve designed this lamb-centered feast in honor of San Pasqual. ¡Buen provecho! This month, spring lamb makes for a savory entrée. Soak currants in red wine 10 minutes. In large sauté pan, warm olive oil over medium heat. Add ground lamb. Using spoon or spatula, break up lamb pieces as meat cooks (3–4 minutes). Add red onion, wine-soaked currants, olives, and mix thoroughly. Remove from heat and add feta cheese. Season with salt and pepper. Let mixture cool slightly before assembling empanadas. Preheat oven to 400 degrees. Whisk together egg and 2 tablespoons water. Place one sheet puff pastry on flat, lightly floured surface. Roll out pastry to about half its original thickness. Cut into 10 or 12 equal squares. Place 1 heaping tablespoonful of filling in center of each square. Brush edges of squares lightly with egg-and-water mixture. Fold each square in half to form triangle. Using a fork, crimp edges of squares, and pierce top once to create steam vents. Arrange on lightly oiled cookie sheet and brush top of each empanada with remaining egg wash.
Bake 8–10 minutes or until golden brown. (Check often—oven temperatures vary dramatically!) Let cool before serving with Lemon Mint Cream. Lamb and mint are a classic combination, but when you spoon this Lemon Mint Cream over your Spring Lamb Empanadas, you’ll give the traditional pairing a Southwestern twist. 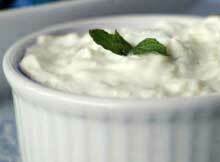 In mixing bowl, combine sour cream and milk. Whisk until smooth. Add remaining ingredients and mix well. Lamb is a traditional meal in northern New Mexico. This preparation incorporates spicy chile—another New Mexican tradition, to be sure! Heat oil in heavy, large-bottomed soup pot over medium-high heat. Add lamb stew meat, evenly covering bottom of pot. Let lamb brown 8–10 minutes before stirring, then cook another 5 minutes. Add onion and garlic. Cook 5 minutes more, stirring occasionally. Add salt, chile powder, cumin, coriander, and oregano. Cook another 2–3 minutes, stirring constantly, until very fragrant. Add wine and cook 1 minute. Add vegetable broth, reduce heat to simmer, and add honey. Simmer 30 minutes or until lamb is tender. Adjust seasonings with salt and pepper, and finish with fresh rosemary. 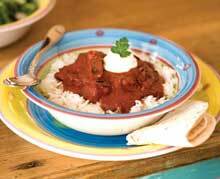 Serve over steamed rice with dollop of sour cream and warm flour tortillas. This light, seasonal salad pairs nicely with hearty lamb dishes. 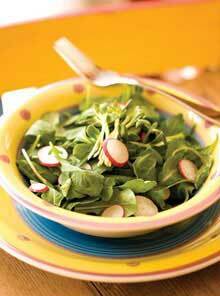 In large salad bowl, combine radishes, greens, pea shoots, chives, and parsley. Mix well. Drizzle lemon juice and olive oil over mixture. Season with salt and pepper. Toss gently. Top with crumbled feta cheese if desired.